Studio Line: Criterion - Indescribable…Indestructible…Nothing Can Stop It! "Beware Of The Blob!" One of the great cult classics, The Blob melds '50s schlock sci-fi and teen delinquency pics even as it transcends these genres with strong performances and ingenious special effects. Made outside of Hollywood by a maverick film distributor, a crew experienced in religious and educational shorts, and a collection of theatrical talent from Philadelphia and New York, The Blob helped launch the careers of superstud Steve McQueen and composer Burt Bacharach. Director: Irvin Shortess Yeaworth Jr.
DVD: Widescreen 1.66:1/16x9; audio English Digital Mono; subtitles none; closed-captioned; single sided - dual layered; 19 chapters; rated NR; 82 min. ; $39.95; street date 11/7/00. Supplements: Two Audio Commentaries: One by Producer Jack H. Harris and Film Historian Bruce Eder; The Other by Director Irvin S. Yeaworth, Jr. and Actor Robert ("Tony") Fields; Theatrical Trailer; BLOB-abilia! : Collector Wes Shank's Rare Trove Of Stills, Posters, Props (Including the Blob Itself! ), and Other Ephemera; Special Collectible Poster. While I don’t profess to be an expert on the subject, my minor experiences with horror films shows that the genre underwent a significant change in the 1950s. In the Thirties and Forties, those flicks were filled with scary but sympathetic monsters; from The Mummy and Frankenstein to The Wolf Man and The Phantom of the Opera, these were characters that the audience may have feared but about whom they cared. Much of that sentiment appeared to evaporate in the Fifties, when horror movies tended toward less-human and emotional monsters. Although some claim that the lead in The Creature From the Black Lagoon seems tragic, I didn’t see him that way; he seemed like nothing more than a fairly one-sided critter who showed little personality. That tendency was even more evident in many of the decade’s other horror flicks. Audiences found mutated insects and other creatures and terrors from outer space. Not all of them lacked personality or sympathetic tendencies, but I think most of these monsters were generically evil threats whose actions lacked thought or reason. Such a creature headlines 1958’s The Blob. Somewhat inspired by a similarly-brainless threat in The Thing, this film featured an apparently-unstoppable bit of goo that grows and grows as it consumes additional victims. Why does it act this way? Biological needs, I guess; we see no signs of intelligence or rational thought from the monster as it devours every organism to cross its path. Was this plot influenced by the fears over the spread of communism? Perhaps. The essay in the DVD’s booklet feels that the movie acts more as a statement against the rampant consumerism found in the post-war United States, and that impression may be correct. I couldn’t help but think of the communist influence, however, since the generic aggressiveness of the villain seems to reflect American opinions of the apparently-inexorable progression of communism. Whatever the backdrop, The Blob is strongly a part of its time, and that’s probably the movie’s main charm. It provides such a clear snapshot of its era that it often feels like a look inside a time capsule; The Blob seems to depict its period in an evocative and convincing way. As for the rest of the film, it’s a mixed bag of campy thrills. The Blob combined horror with the then-popular “juvenile delinquent” genre, though its sympathies clearly resided with its teenage protagonists. These kids aren’t bad seeds, and they’re presented as more prescient and in-tune with their environment than the adults. Too bad they aren’t shown as realistic, well-defined characters. Part of The Blob’s claim to fame stems from the fact it was the role that vaulted Steve McQueen to prominence, and while he certainly shows a nicely edgy and vivid presence, his character - coincidentally named “Steve” - is a pretty flat creation. None of the other teens or adults appear lively or distinct either, and this lack of strong personae is one of the movie’s weaknesses; frankly, I rarely really gave a hoot about any of the participants. Actually, the film’s most compelling performance came from Olin Howlin as the “old man” who initially encounters the blob. He lives up to his last name with his cries and moans as the creature gloms onto him; the dude provides a fairly harrowing portrait of an elderly guy in a lot of pain and he makes the threat of the monster much more believable than it otherwise might have been. Otherwise, The Blob sticks to a fairly campy and goofy experience. Did this thing scare audiences at the time? I guess, but it hasn’t aged very well in that regard; it seems too overwrought and silly to provide many modern scares. Part of this problem relates to the presence of the titular monster, who disappears from the story for substantial segments. While I agree with the premise that such a creature should not be overexposed, we need to be reminded of its existence periodically. That doesn’t happen here; substantial periods pass without involvement of the blob, and I thought the story suffered because of this. Frankly, your enjoyment of The Blob will depend on your interest in dated old horror movies. I think the monster movies from the Thirties and Forties hold up better than most of those from the Fifties just because they seem more timeless. Even the biggest fans of The Blob can’t claim it hasn’t become a period piece, and while that adds some charms, it causes some problems as well. Ultimately, The Blob is a mildly-entertaining experience but it didn’t do a whole lot for me. 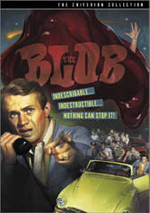 The Blob appears in an aspect ratio of approximately 1.66:1 on this single-sided, double-layered DVD; the image has been enhanced for 16X9 televisions. While not flawless, the movie looked quite good, especially for a low-budget program its age. Sharpness appeared nicely crisp and well-defined throughout the movie. I didn’t discern any signs of soft or hazy images as I found a very clear and concise picture. Moiré effects and jagged edges presented no significant concerns, and I also witnessed virtually no artifacts from the anamorphic downconversion on my 4X3 TV. Print flaws appeared wonderfully absent. A little light grain could be seen at times, and some black grit occurred toward the end of the movie, but that was about it; otherwise the film seemed free of speckles, scratches, hairs, blotches, tears or other defects. Colors looked very solid and they always displayed bright and bold hues. These tones showed no problems related to bleeding or noise, and they seemed quite true and clear. Black levels tended to be a little on the gray side, however, and shadow detail occasionally appeared somewhat thick and heavy. Some of those concerns seemed related to the use of “day for night” photography - a technique that often causes such problems - but not all of them appeared linked to that style, and a few of these shots were a little excessively dark and impenetrable. Nonetheless, I thought that the visual appearance of The Blob was largely terrific, and it was a treat to see. Much less satisfying was the movie’s monaural soundtrack. Frankly, it’s a bit of a disaster, mainly due to the quality of the dialogue. Speech usually came across as harsh and sibilant. The lines could be quite distorted and they also often seemed poorly integrated with the action; it appears that some bad dubbing occurred, and this problem exacerbates the already-poor quality of the dialogue. Music sounded tinny and shrill, and effects were frequently rough and distorted as well. I detected some tape hiss that appeared through much of the movie. Although I can forgive some flaws due to the age of the material, the audio for The Blob seemed too faulty to get a rating about a “D+”; it can be tough to listen to this track. The Blob adds a few solid supplemental materials. Most compelling are the DVD’s two running audio commentaries. The first involves producer Jack H. Harris and film historian Bruce Eder. As is typical of Criterion commentaries, both men were recorded separately and their remarks were later edited together; the same went for the second commentary as well. The first track mainly provides statements from Harris, who provides a lot of terrific information about the creation of the film. He covers the project’s genesis and a lot of elements about its shoot plus its afterlife and facts related to the world of low-budget horror flicks in the Fifties. Eder adds some additional historical perspective, but it’s really Harris’s show. All in all, I enjoyed the commentary and it added to the experience. The same goes for the second track, which features director Irvin S. Yeaworth and actor Robert “Tony” Fields. Some of the material covered repeats information heard in the first commentary, but we hear alternate perspectives in this piece and get a lot of different details. I thought there was a good balance between the two participants; Yeaworth probably dominates the track but not to a tremendous degree. Especially compelling are their various comments about Steve McQueen and his effect on the set. It’s another strong commentary that provided a lot of fine information about the film. In addition to these two commentaries, we find the movie’s theatrical trailer plus a section of “Blob-abilia”. The latter features 65 frames of images. Most of these were shots from the production, but we also see some close-ups of props from the film and a gallery of movie posters. I found some of the foreign ads most interesting, though I wish they’d clearly indicated the date of release for these non-US markets. It seems likely that at least the French and German posters don’t date from the late Fifties. The former is especially amusing as it depicts McQueen with his shirt torn open to display his muscular chest; I believe this release of the movie was done to capitalize on McQueen’s subsequent fame, especially because he looks much older than his appearance in The Blob. In the DVD’s booklet, we find a decent little essay from film professor Bruce Kawin. This text concentrates too strongly on a plot synopsis, but it also offers some interesting reflections about The Blob. Additionally, the package includes a small reproduction of the movie’s theatrical poster. The Blob stands as an example of horror movies from the Fifties and works well within those limitations. It lacks compelling characters and much fright value, but parts of it can be entertaining. The DVD presents a terrific picture and some nice supplements but offers poor audio. Although I didn’t care much for The Blob, fans of the genre will likely enjoy it.